So finally got round to fitting a few engine mods I've had sat in the garage for a while. ER chargepipe, Forge DVs, Oil Catch Can and RB pcv. Figured it was best to fit them all in one go as you have to remove the cowl, engine cover and the DCIs all out the way. None of the above will suddenly add any power etc but are all for the bigger picture and help to keep the internals a little cleaner and maintain boost where the oe items would have been restrictive. Last edited by RajB; 12-08-2017 at 09:14 AM. Still unsure on those cowl filters. We've fitted a set to a mates 135i so if they all good then will get some. Will save a huge amount of weight too lol. That cowl is bloody heavy. Also would need to find the best location to mount the sensors that are clipped to the cowl. Nice job, good basis for some serious mods there. I think the OCC, RB PCV and charge pipe are essentials if any engine works are planned. I've been thinking about the cowl removal for a while, will be interested to see how you get on with it. What's next in the works? Turbo Dynamics Stage 2+ Hybrid turbos - Evolve FMIC - VRSF catless DPs - Remus Race exhaust - Injen CAI - VRSF CP & HKS BOV - Quaife LSD - Gladen 120.4 DSP kit - CIC to NBT Upgrade - JB4 G5 w/ race flash - Ohlins R&T suspension - next mod: go faster stripe. Still got a set of sport side skirts and the M3 front control arms to do. Can't decide whether to get a set of the Cyba or Afe scoops. Consensus seems to be that water ingress isn't a big deal since all electrics should be watertight anyway. I'm still on the fence, I'd love the sound improvement but the cowl does stop water, snow and various other crap getting right into the engine bay. 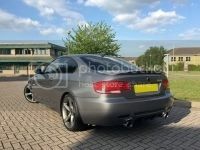 Need to get the rear diffuser done in gloss black to match up to the rear of the spoiler. They should come gloss black out of the factory! I wish it had as would save me the cash lol. This is more of a starter for the process of my next mod as there's a little more work involved lol. I actually picked this up off eBay (before I'd even bought a car lol) in November for the princely sum of £80 lol. Now as you can see it isn't mint but I figured maybe it just needed a bit of machining and possibly a re-lacquer. Unfortunately not though. The guys who will be doing the roof swap said a couple of the scratches were a little too deep. 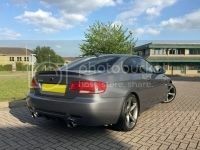 So after doing the deal with Sam on his bumper etc and telling him of my plans to do this mod he was intrigued. So we found another one and I bought it too lol. The second one has a little bit of delaminating but I've found a company that can repair both and basically return them to new. So need to work out the logistics of getting them both up to the guy to repair and then get the one fitted to mine and see if anyone would like the other. Will keep you updated of the repair process. This is one mod I've ways wanted to do to my cars and finally think the 335i is the one to get it. These will help to lower the centre of gravity as they are damn light. Good work on the car man, a great choice of mods and the CF roof is a very unique idea - looking forward to seeing it fitted! Do you know how much lighter it is than the non-CF roof? Haha this will look awesome! Not sure on the weight of the oe roof but once it's repaired and passed to the body shop guys I'll get them to weigh both to compare. Will be interested to know myself tbh lol. Cheers. Hoping it will look very unique and I love the fact it's OE and genuine CF as opposed to just a wrap etc. You're not f&cking around dude!! The roof is going to be amazing!!! This is gonna be one badass motor! I know I passed up a good opportunity but when I'm getting married in the same year as I went Accuair - something's gotta' give LOL. This is one absolutely epic and unique mod! Lol Greg, thanks. I don't tend to. For some reason I find it hard to resist. I see the end goal and just go for it. You only live once LOL. Cheers buddy. Hopefully peeps will like it. I thought about it before I even bought the car and when the first one came up I couldn't resist lol. I've got to get both up to the guy to be repaired first. Then he's said 2 weeks to do both. Fingers crossed all straight forward lol. I fully understand tbh. Let's see when I actually meet the guy if I can't work my Indian magic on the costs lol.